This post is sponsored in conjunction with #AppleWeek. I received product samples from sponsor companies to aid in the creation of the AppleWeek recipes. All opinions are mine alone. I have not shared a boozy recipe in some time so that needs to change! Todays the day for it! My friends, Caramel Apple Cider Vodka Slush is a fun autumn cocktail. I use three ingredients, including ice to make this refreshing apple cider cocktail. Ready, I use caramel vodka, apple cider, and ice to get the most thirst-quenching cocktail! I live on Long Island, I think Long Islanders are the only people who say live on, everyone says I live in “whatever state”. 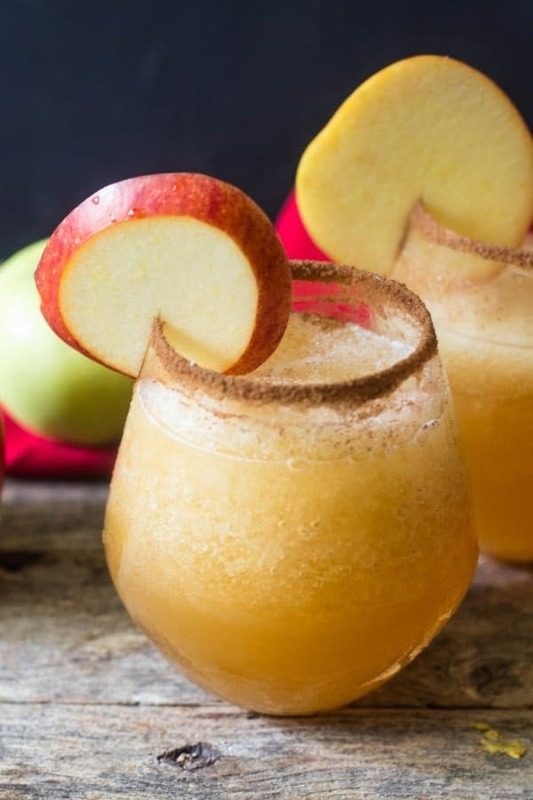 Okay, anywho back to my caramel apple cider cocktail recipe! We were out east at a farm/winery last year. They had all sorts of treats and drinks for sale. Well, they had a non-alcoholic apple cider slush and it was just delicious! I knew I had to recreate it! I have a very popular recipe for Strawberry Vodka Slush CocktailSo it was a no-brainer for me, I knew I had to turn the apple cider slush into a cocktail. I came home with a bunch of freshly picked apples and made homemade slow cooker apple cider, which by the way is delish! I got some caramel vodka and ice, threw everything in the blender and tada, Caramel Apple Cider Vodka Slush was born. 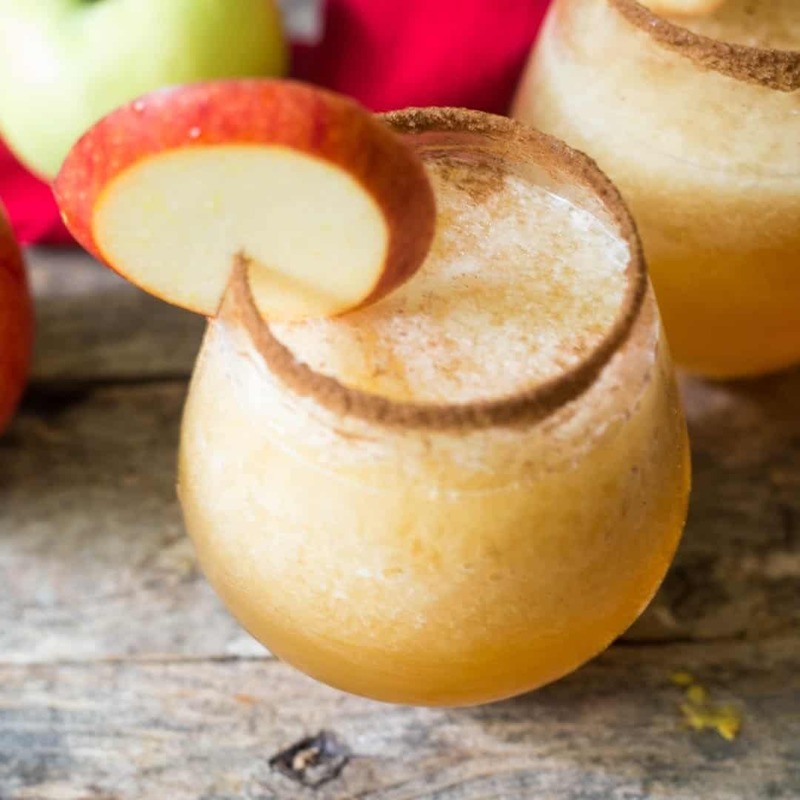 No, you do not have to make your own homemade apple cider to enjoy this fantastic cocktail. You can buy ready-made apple cider for this recipe. What if I don’t own a blender, how can I make Caramel Apple Cider Vodka Slush? Well, I highly suggest you purchase a blender or put one on your gift list! I would suggest just mixing the caramel vodka and the apple cider with ice. You can also try putting ice cubes in a sealable storage bag and bang the heck out of the bag of ice with a mallet or bat. You will most certainly enjoy the apple cider cocktail after all that crushing. Can I make this a non-alcohol apple cider slush for the kids or those who choose not to imbibe? Absolutely! Just leave out the vodka. I made one today for my daughter. I use a specific apple garnish if it’s an adult party where I have both spiked and non-alcohol apple cider slushies. So the non-alcohol apple cider slushies are decorated with a green apple slice. The caramel apple vodka slushies are garnished with a red apple slice. How do you store the Cider Apple Vodka Slushies? When there are leftover, well that is rare, I put the leftover apple cider cocktail in a storage container and I keep it in the freezer. When ready to drink them, remove from freezer, let defrost a bit and give it a whirl in the blender. Apple Week is almost over and I have so enjoyed creating recipes for you all! Have you made any of the recipes yet? Let me know, I would love to hear from you? I started out the week with Cider Braised Chicken and Cabbage, then on to Baked Apple Donuts, and yesterday was my yummy Apple Pecan Salad with Maple Cider Vinaigrette I’m getting hungry just thinking about these recipes. I am also loving all the recipes from my fellow food bloggers. Their recipes are at the end of the post with the giveaway and sponsor info. How to Make Caramel Apple Vodka Slush? Into a blender add ice, caramel vodka, and apple cider. Serve in a glass rimmed with cinnamon sugar which is 1 teaspoon cinnamon and 2 -3 teaspoons of sugar. I love seeing my recipes when you make them! Share them with me on Instagram! Do you love this Caramel Apple Vodka Slush, giving it a 5-star rating and any comments below always are very helpful for me and so much appreciated!! Caramel Apple Vodka Slush is a great cocktail to enjoy on a fall day! Refreshing and full of flavor from the apple cider. In a blender add caramel vodka, apple cider, and vodka. 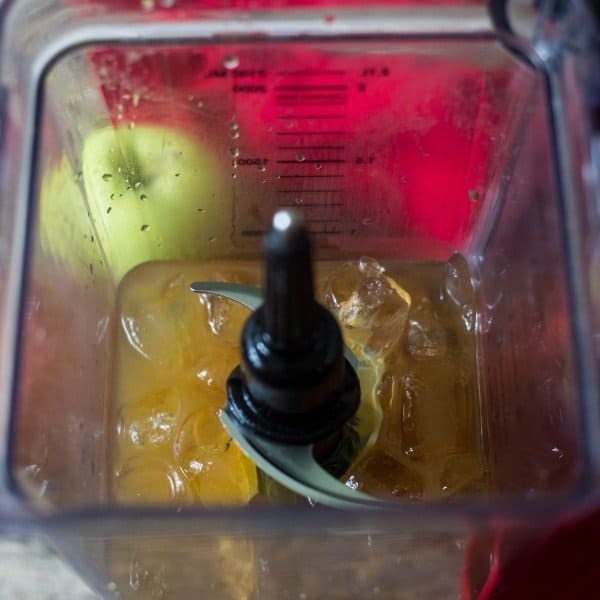 Use either the Crush button or Blend to mix ingredients and crush the ice. The ice should crumble. When you have the consistency of a slush, pour into a glass and enjoy. Rim the glass with cinnamon sugar. And serve with an apple wedge for garnish. In a small bowl blend sugar and cinnamon. To rim a glass with the cinnamon sugar, dampen the rim of the glass with either water, caramel vodka, or apple cider. Then dip the rim of the glass in the sugar mix. This looks amazing and the flavours sound out of this world. This would be dangerous for me as I’d drink it way to fast and want more! It is a good one! I hope you enjoy! This recipe looks refreshing and delicious! I love how easy it is, and how quickly it comes together. If there was ever the perfect autumn cocktail, its this! Thank you Nicole! I hope you enjoy! You are totally singing my song with this cocktail!! Vodka and I are bffs and of course, all things fall are my very next favorite. I’m a sucker for anything caramel, I can’t wait to try that vodka. Excellent Lauren, glad you enjoy the cocktail! OK clearly I am not making enough boozy goodness with my apples! This looks like an awesome way to spend a fall happy hour, especially on the warm ones we’ve been having here in New York lately. Glad you enjoy this vodka slush! A favorite of mine! Oh wow this is showstopping and so yummy! Making it’s way to the top of the Holiday cocktail list!! Eileen, this recipe is brilliant. You have all of my favorite fall flavors in one cocktail. I will be making this caramel apple cider vodka slush for girls night at my house!! YUM! Katie, thank you so much! I hope the girls love it! Enjoy! I am so glad you have given non-alcoholic version too, this slush looks so perfect, the autumn cocktail at it’s best! Jagruti, appreciate that you enjoy the alternate non-alcohol slushie! The mocktail is awesome too! I love the sound of this cocktail! So easy to make and with so little ingredients it’s perfect. 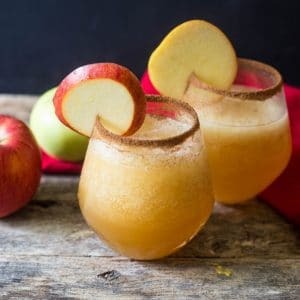 I’ve tried a few vodka cocktails but never one with apple cider, can’t wait to try it. I am so happy you enjoy the cocktail! It is delish! Thank you Karyl,I love this cocktail too! Awesome Kiki! 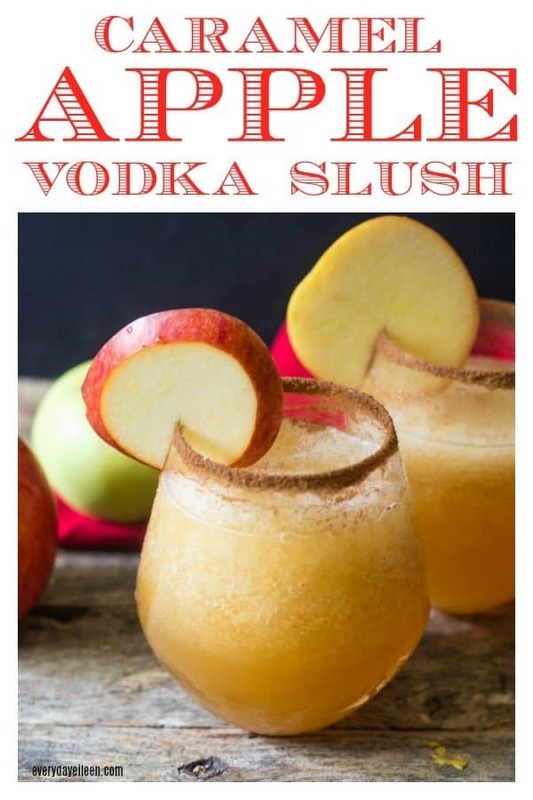 Happy Thanksgiving and enjoy these caramel apple vodka slush cocktails! I don’t see many fall cocktails, and I love that this has apples in it. Thanks for sharing. Glad you enjoy the apple cider slush and enjoy Anne! These looks absolutely delicious and I love that you can easily make them into a mocktail. Your trick for knowing the difference between the adult version and the kids version is brilliant! I am so glad you liked my adult/child beverage trick! I have a busy week ahead and I am going to need one of these when it is all said and done! Thank you for taking the time to let me know you love the slush too! I’ve been looking for a fall cocktail – this is perfect. It’s been a rough couple of weeks (and only going to get worse), so you can be sure I’ll be trying these soon! I hope it gets a little easier Liz! I am with you, when my busy time is over, it will be time for me to whip up one of these too! So glad you enjoy Wendy! this is SO SO pretty! i love how it still seasonal but looks so refreshing at the same time! we’ve been having some warm weather here so I’d love to try this! Thank you Georgie! I so appreciate your comments on the Caramel Apple Cider Slush! It will certainly be refreshing for warm and cool days! So glad you enjoy!